Emma Lawrence is an award-winning Shropshire based Illustrator, Author & Designer. Emma’s unique and recognisable style using pen and mixed media is fresh, fun and appealing. Customers love the clean lines, humour and popular themes from animals wearing wellies to jugs and cups full of wildflowers. The beautiful Shropshire countryside, where her studio is based, provides plenty of inspiration for her drawings. These have been added to a wonderful range of high quality greetings cards, stationery and gifts. Emma is available for commissions and is able to help turn your idea into something memorable, attractive and eye-catching. Her logos and branding can be seen on the side of buildings, banners or business cards and clients include the NHS and a host of smaller businesses. She has written and illustrated the Little Nature Explorers® series of children’s books which encourage young children to get outside, explore our amazing wildlife and learn lots of interesting facts about them. See www.littlenatureexplorers.com for further details. 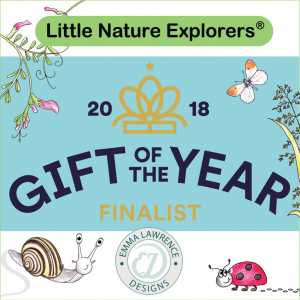 Her range of gifts for children which were developed from the book illustrations made it to the final of Gift of the Year 2018 and were runners up!